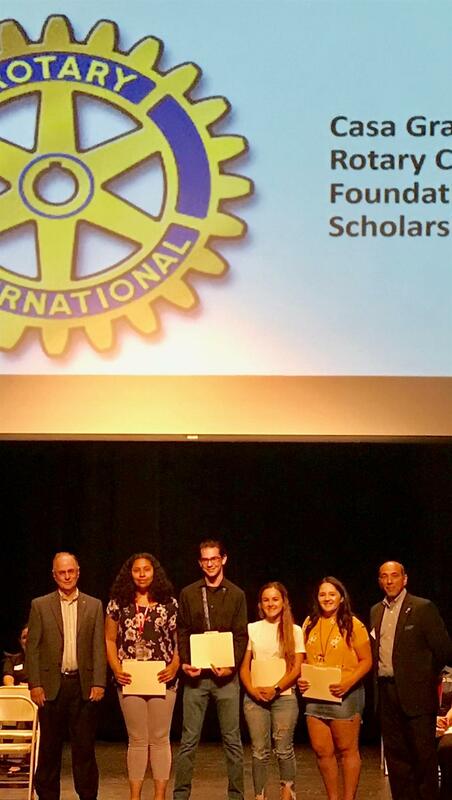 The CG Rotary Foundation awarded 25 high school students a total of $35,000 in scholarships this school year. Over 44 students applied for the annual scholarship awards and after submitting essays, GPA, and FAFSA documents, 25 students were interviewed by the awards committee of PP Randy Lessor, PP Louie Sanchez and PDG Steve DiMuzio and PP Nick DePadre. As a result 2 four year scholarships and 6 two year scholarships and 17 One year scholarships were awarded. Twenty one students from Casa Grande Union HS received awards on Thursday, May 10 and 4 from Vista Grande received their awards on May 14th. Pictured here are PE Donavan Kramer and PDG Steve DiMuzio with the award recepients from Vista Grande HS. The CG Rotary meets the first two Tuesdays of each month at Mimi's located at the Promenade Mall on Florence Blvd at 11:45 AM. We meet in the back room and order off of the menu. Guests are always invited to join us for lunch and our meeting. The Third Tuesday of each month we travel to different locations for a evening social. Family, spouses, friends and prospective members are invited to attend. For September the location is Boston Pizza on Florence Blvd at 5:30 PM. The Fourth week of each month we engage in a local service project. Recently we cleaned the yard of a couple unable to maintain it due to poor health. Time and location TBA. The 34th annual fundraiser in support of Scholarships and Youth activities of the Casa Grande Rotary Foundation will occur on Sunday October 7, 2018 at the Gardens at J Warren's 1451 E Florence Blvd. This year's event will be a raffle of more than 100 items. Tickets are $40 each and gives each purchaser a one in 4 chance of winning a prize. Prize values start from $25 to several thousand. The Grande prize is yet to be determined, but will match with excitement and value last year's trip to Waikiki. Stay tuned here for the announcement. Tickets are available from any Rotarian or call 520 252 9072 for Steve. Ticket holders are invited to attend the event and enjoy appetizers and drinks, a cash bar will be available. Come and support this Casa Grande Tradition. Scholarships to date total more than $1.258 million and more than $178,000 donated to the boys and girls club of Casa Grande. 24 of the Scholarship recepients were in attendance to receive thier award to continue on with their education. A Gift of Life Story! Matt Lemberg, Rotarian and Director of the CG Boys and Girls Club thanked the CG Rotary Club for its on going support at this past Tuesday's meeting.